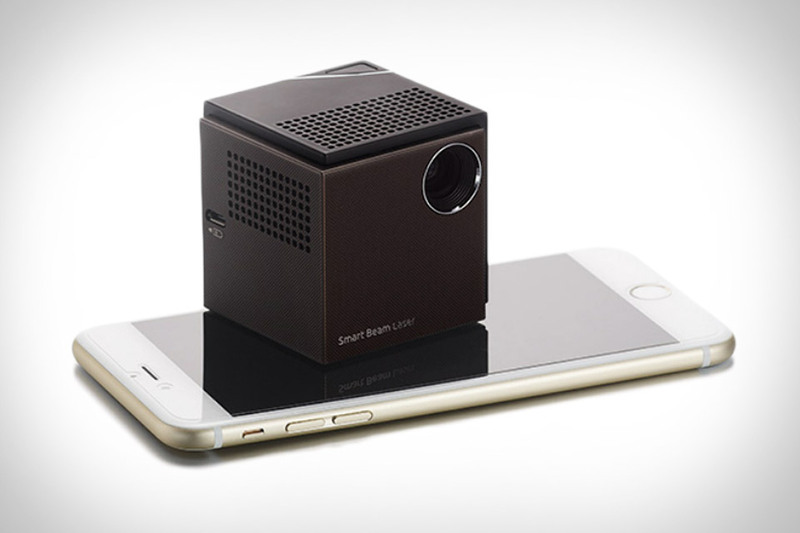 Small projectors are nothing new. But most involve compromises, either in the maximum resolution or brightness. The UO Smart Beam Laser Projector offers both 720p resolution and 60 lumes of brightness in a cube that measures just 2.2 inches in each direction. As the name suggests, it uses an advanced laser diode and LCOS tech to project your images up to 150" in size, accepts wireless and HDMI input, and has a battery life of up to two hours, or just long enough to catch a movie in the backyard. You've cut the cord. Now cut down on your remotes. The Sideclick promises to turn the remote for your streaming box into the only remote you need. Available in four different variations for the most popular boxes around — those being the Roku, Amazon Fire TV, Amazon Fire TV Stick, and Apple TV — these remotes attach to the side/back of your existing remote, adding crucial TV controls like power, channel, volume, and input that are missing from the streaming controls. Thanks to infrared learning technology, it lets you program those six buttons however you want, and ensures that it will work with your TV, whether it's a Sony or a Seiki. Having trouble deciding between a fancy new curved TV and a standard flat set? Thanks to the LG Flexible UHD 4K Smart OLED TV, you won't have to choose much longer. Formally known by the model name 77EG9900, this 77-inch set features a flexible, WRGB OLED 4K panel, allowing you to determine the degree of curvature, or even eliminate it entirely. Other features include QuantumDot technology, the company's new WebOS 2.0 smart TV platform, and a Tru-4K upscaler to make sure that even lowly SD content looks its best. Blu-ray offers outstanding quality, but all the hassles of a disc. Direct downloads from Amazon, iTunes, and Google Play are incredibly convenient, but highly compressed. The Kaleidescape Cinema One combines the best of both worlds. Thanks to beefy internal storage, it can store up to 100 movies in Blu-Ray quality, whether you load them in disc-by-disc or download them from the Kaleidescape Store. When it's time to watch something, the award-winning interface makes it easier than finding the remote. And should you need even more storage, you can add another unit for double the storage, or go full cinephile with the DV700 Disc Vault that holds a whopping 320 Blu-Ray discs. There are a lot of set-top box options out there, but if we're being honest, most of us just want access to Netflix, Hulu, and maybe a couple other services without using the junky built-in apps on our TVs. The Amazon Fire TV Stick will let you do just that without the need for yet another box. Powered by a dual-core processor, it's no slouch despite its tiny size and low cost, packing 1 GB of RAM, 8 GB of storage, support for Dolby Digital Plus surround sound, and, for Prime members, access to a huge library of premium content, totally free. Just plug it in, connect it to Wi-Fi, and go. Google's Chromecast is a great way to beam stuff from your Android to your TV, but some people have wished for something more — something like an Android console. The Google Nexus Player is exactly that. This sleek circular black box connects to your TV via HDMI, includes a simple remote with voice search, features a powerful Intel Atom processor and fast 802.11ac wireless networking, supports a wide range of apps and games, and for the latter, even supports dedicated controls for a precise gaming experience. The original BeoVision Avant TV was certainly impressive — but at 55 inches, it was a little small for some tastes. The Bang & Olufsen BeoVision Avant 85 should fix that. Measuring 85 inches diagonally, this 4K Ultra HD set offers all the slick features that made its little brother so compelling, including a 3-channel speaker system that folds out on demand, the ability to expand to a full, wireless 7.1 surround system, 2D local backlight dimming for outstanding picture quality, and three sleek mounting options — on the wall, on the floor, or on the table — that are all motorized to give you the ideal viewing angle.